Browse for kickstands by vehicle make and model. Kickstand with 5" long arm for electric scooters. Built-in spring holds kickstand out of the way when not in use. Includes mounting bolt and lock washer. 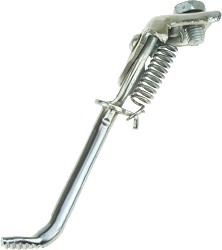 Chrome plated steel kickstand for Razor E100 and E125 electric scooters. 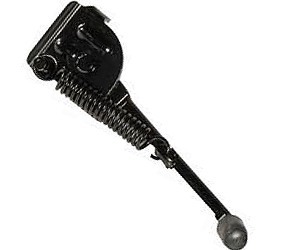 Chrome plated steel kickstand for Razor® E300, E300S, and E325 electric scooters. Kickstand with mounting bolts for the Pulse® Charger and Lightning electric scooter. Black enameled steel 2" (50mm) kickstand for 2008 and later year model IZIP® I-150 electric scooters. 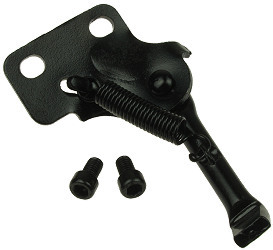 Black enameled steel 4" (100mm) kickstand for IZIP®, eZip®, and Schwinn® electric scooters. 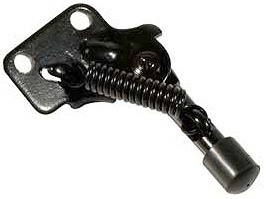 The kickstand bar is 4" long but the overall size of this part is 4-7/8" long x 2-1/8" wide. 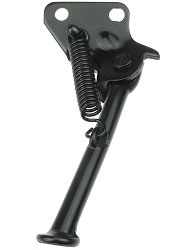 Black enameled steel 6" (150mm) kickstand for IZIP®, eZip®, and Schwinn® electric scooters.